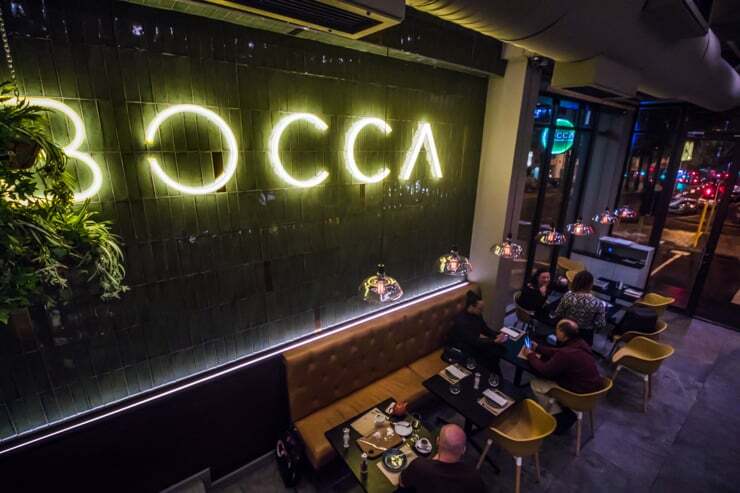 Most you, like me, have probably been to Bocca once or twice but haven’t really moved it onto your top 10 list. Over the years, girl friends and I would pop in but it just missed the mark for me as an overall dining experience. It always felt a little impersonal even though the service was attentive. 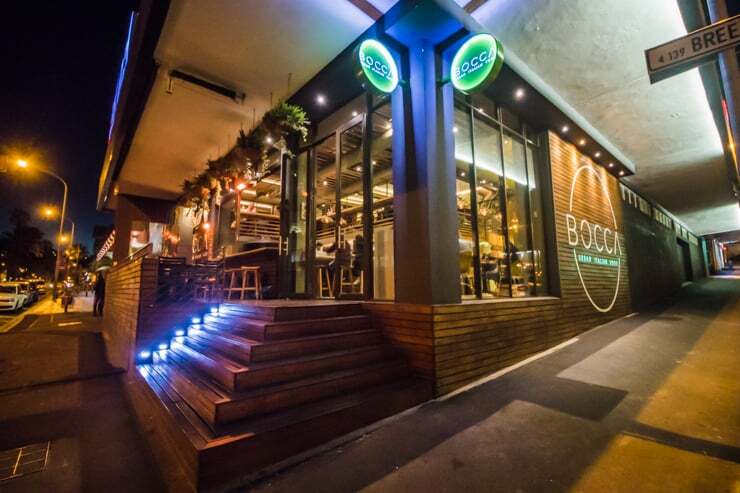 Earlier this year Mr John and I were invited to visit and I nearly declined thinking, “Been there, done that.” But Bocca had recently been bought over by actual Italians which was a game changer for me. Could they add that magic that I felt it just slightly lacked? 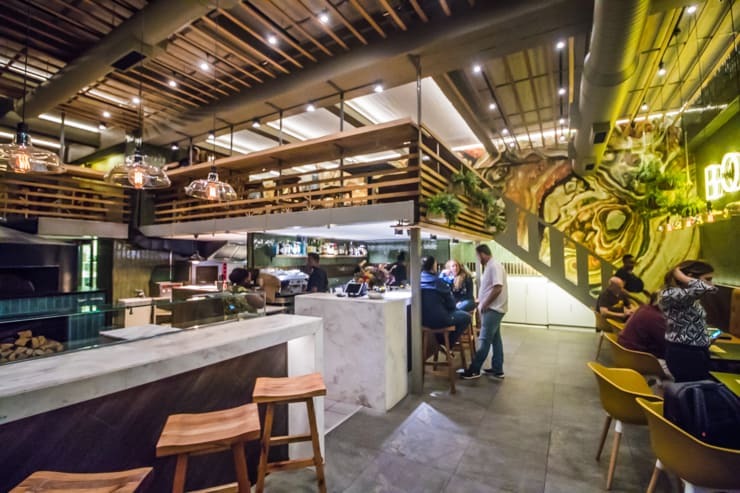 We headed out on a Wednesday night for a FEAST at the newly spruced up venue and what a treat it was! Wow! The new owners Guido and Adnana Brambilla recently left Bermuda and relocated to Cape Town. 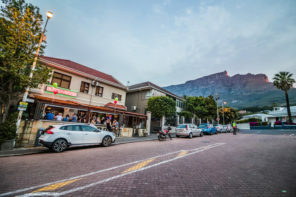 After 8 years in Bermuda we were looking for a change, and of course our first thought was Cape Town because we really love the city,”explains Adnana of their decision to relocate to South Africa. “We had had enough of working in hotels, and were looking for something more personal. Well there is absolutely nothing “hotel food” about the dishes we had during our visit! 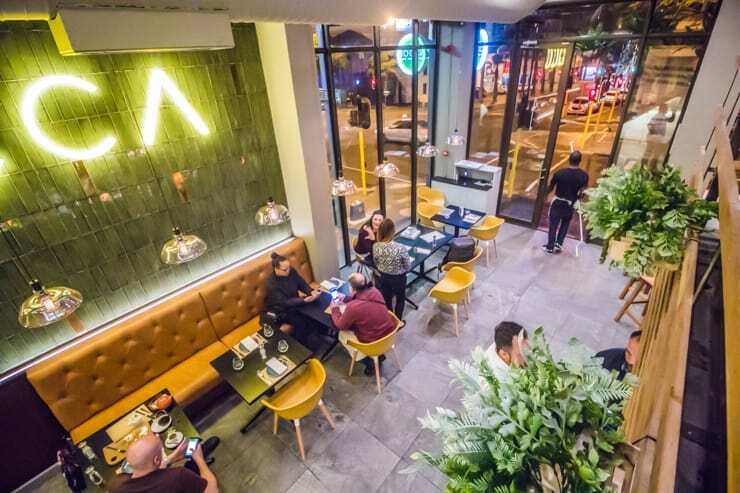 From classic Italian flavours to spruced up renditions, our food was absolutely divine and it was a dream to sit and watch the traffic lights sparkle by from their huge, front glass windows and doors. 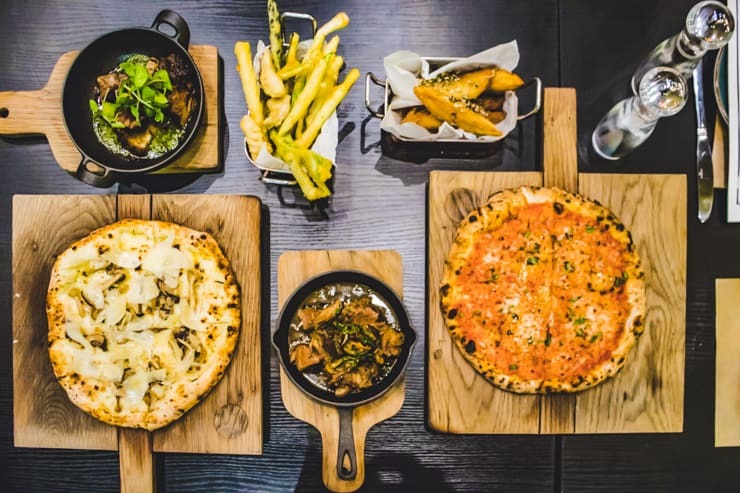 What’s For Dinner at Bocca? Bocca actually means mouth in Italian and our mouths were very happy! We had array of items so that we could get a clear idea of what’s on offer and how the Bocca kitchen delivers. To start, we had a dark & stormy cocktail. These are popular across South African cocktail menus but having lived in Bermuda for nearly a decade, Adnana was keen for us to try “the real deal” and she wasn’t wrong. Definitely the best Dark & Stormy I’ve ever had simply because it was far more refined. That Coka Cola sugary flavour in your mind, throw it out. This had a touch of gingerbeer and it was a joy. 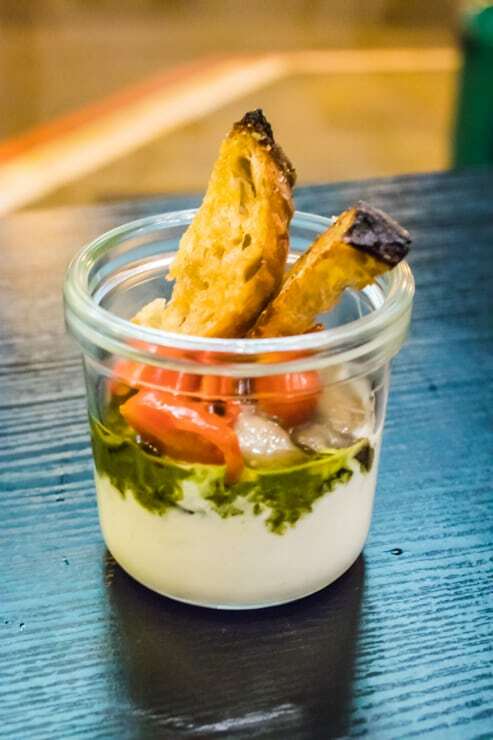 We coupled this with our first few starters including the Straciatella, which was an incredibly indulgent “remix”of the classic 3 colour Italian dish – roasted cherry tomatoes, eggplant confit, basil pesto and crostino (R105). Imagine eating a bowl of slightly thicker, cooler yoghurt except it’s cheese. Rich basil pesto being cut through by the acid of the tomatoes all hovering on crispy, crunchy bread. This is enough for two (I know because AJ didn’t have any and it was a lot!). We also tried the Zucchibi Scapece because I was SO starving that I was going to die if I had anything to drink without a snack. 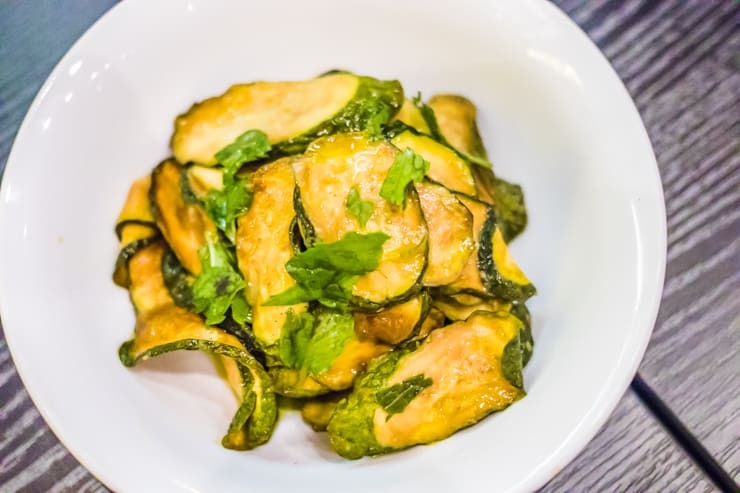 This are beautiful zuccini’s dressed with garlic, int and red wine vinegar and were DIVINE! Firm, but soft on the palate, I could these every day. Needless to say, the starters were a good indication of what was to come and my goodness did we feast! We do I start? Pizza! Veg! Meats! Everything about why I love Italian cuisine. What’s So Great About Veg? On the menu, another absolute favourite of mine – Tempura veg but not just any kind, only the Italian goodness kind: Ortofritto including zucchini, asparagus, artichokes and spring onions (R85). YUM. It’s difficult to describe by it’s so good. Maybe because the focus is on the veg and the batter doesn’t overpower the delicate flavours. It’s a new combination and not the same old onions and carrots. Rock salt over the top, win! 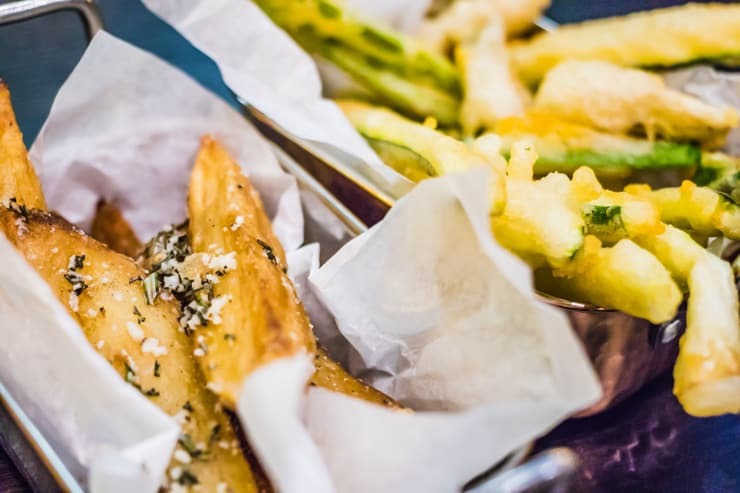 Of course it wouldn’t have been dinner if Mr John hadn’t ordered Ital Chips – twice cooked potato wedges, Parmesan, rosemary with a truffle drizzle (R85). As Irish decent, I don’t feel I need to justify the humble potato. We know they rule the world. It would be remiss if we visited an Italian restaurant and did not have a pizza. AJ ordered a Rita which is a classic mozzarella, tomato sauce and basil pizza (R75) and I ordered the Foresta (R105) on Adnana’s recommendation. 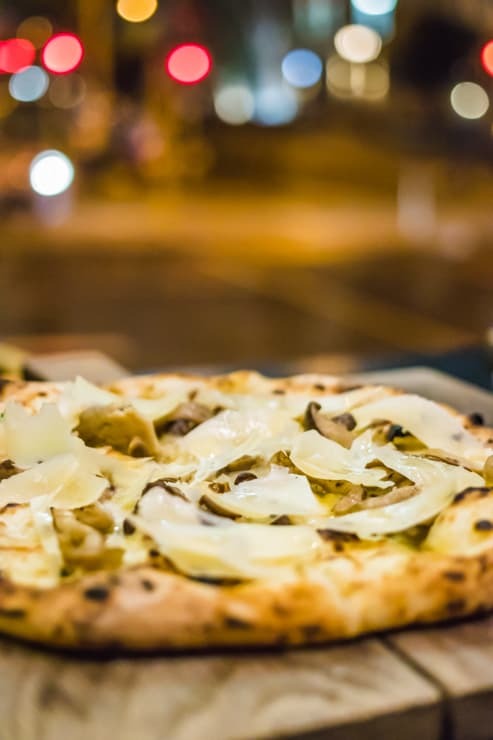 Wild mushrooms, rosemary mascarpone, Parmesan shavings, truffle drizzle this pizza is a vegetarian’s dream of full, big flavours on a bed of soft, toasted dough, delicious. We were curious to try a few of the meat dishes on the menu as well. Listed as Arrosti, 12 hours wood fire roasted meats Mr John and I chose the Beef: angus brisket, red wine, bay leaves and salsa verde while I opted for the leg of lamb, wild mushrooms, thye, bay leaves and garlic. At this stage I might have been out-mushroomed as I didn’t enjoy mine as much as AJ’s. The beef was delicious and worked well with the other items we had ordered. I think the lamb was probably the last straw after courses of rich, delicious food so if you do intend to order a number items go for the beef. 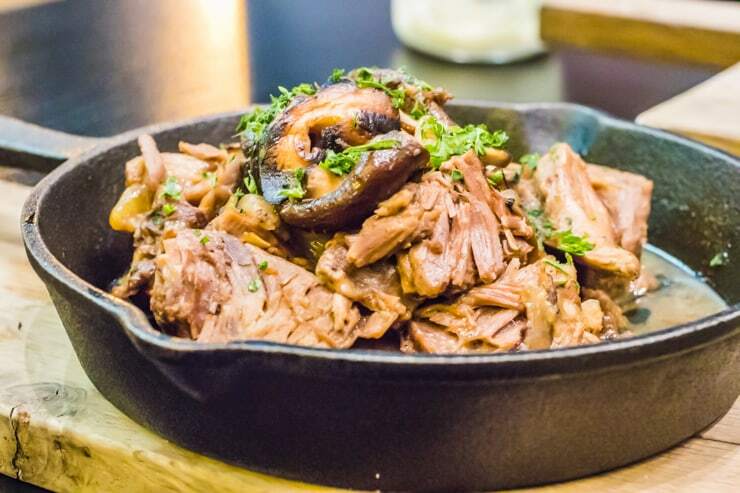 If you’re only ordering a main, the lamb will be good. How Can We Fit in Dessert? We can. We were dying, but we did. 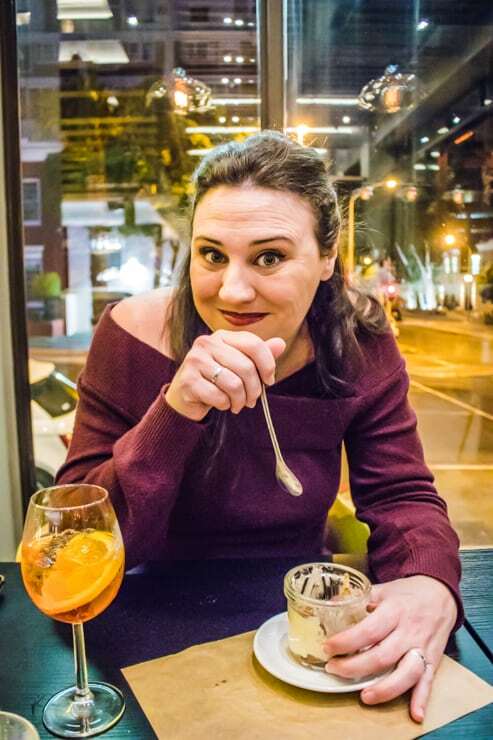 I LOVE Italian Tiramisu, the kind that I have in Italy; 99% of the time not the kind I have in South Africa (dry finger biscuits and a dosing of whipped can cream). So I put the Bocca Tiramisu (R65) to the test and it was delicious! 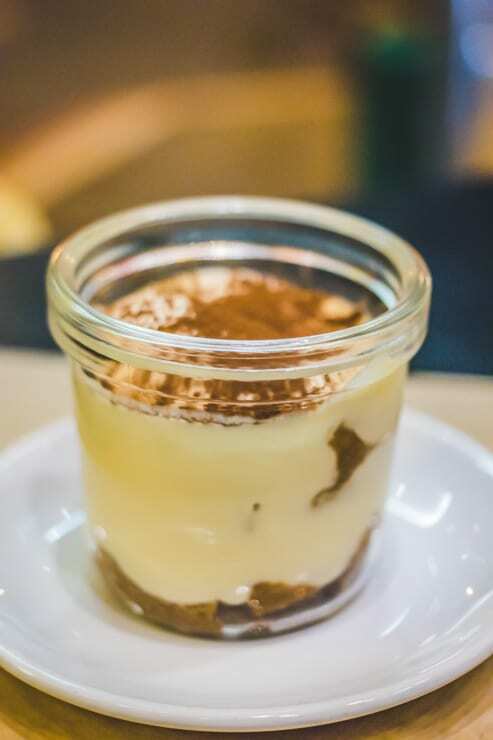 Per me, the major difference is that a good Tiramisu has a custard mousse type consistency, NOT a cream type flavour nor consistency. The biscuits mustn’t be anything like a soggy triffel nor wet biscuits. It’s a fine line to get right but most of Italy is doing it so there’s a way! We were absolutely spoilt at Bocca and it was a meal to remember. I really enjoyed watching the city buzz around us (without the noise). Lots of different types of visitors came and went, including locals and international guests. 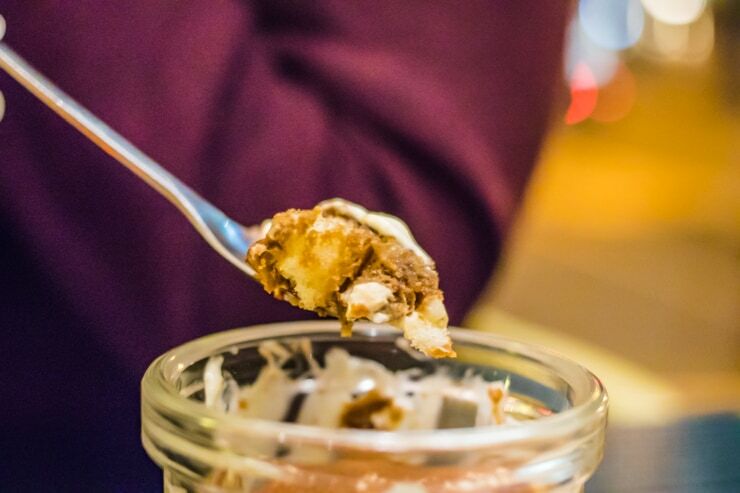 Couples came for a toot at the bar and travelers snuggled in for something hearty. 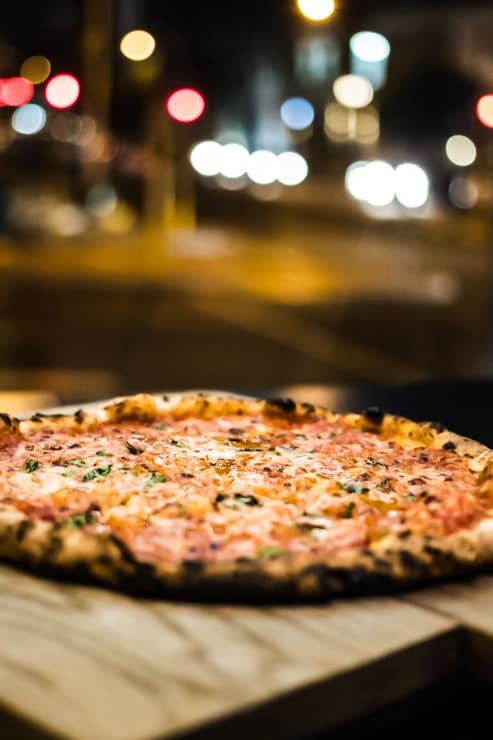 While Italian cooking has a focus on simple ingredients, the best ingredients are used and it creates a homely, rich and delicious eating experience. 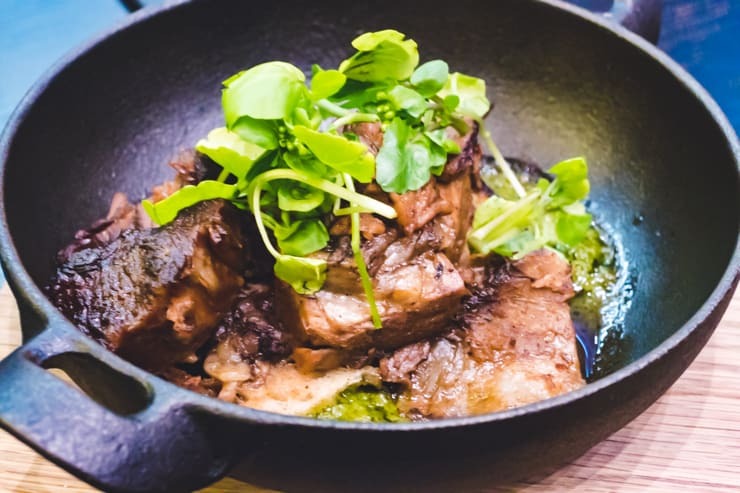 Chef has also cleverly sourced the finest South African equivalents so the restaurant champions exceptional local produce through traditional Italian cooking methods. 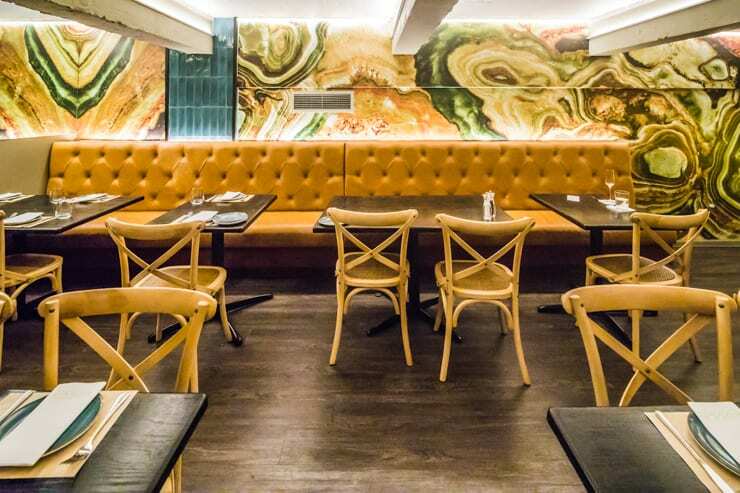 I will definitely be returning to the restaurant so if you’re looking for a date night restaurant, keep Bocca restaurant in mind and try a few things. Mix and match, test and trial your favorites. 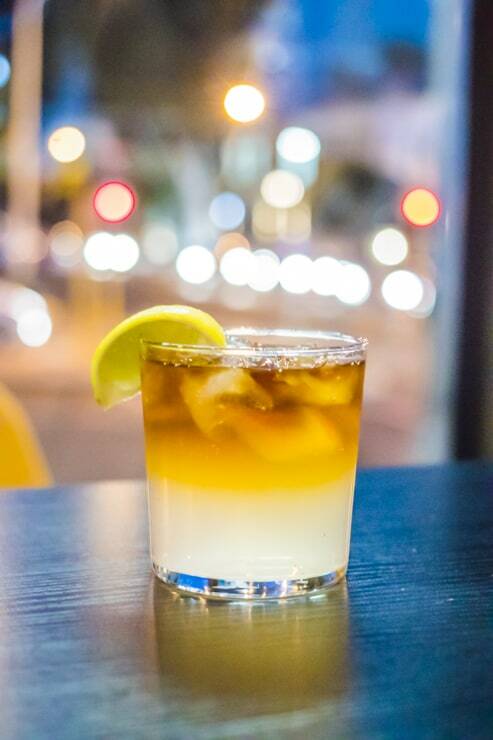 And definitely give the Dark & Stormy a go. This post was not sponsored, however, our meal was furnished by Bocca. Photo’s by Team Team Photography. Do not use without permission.